We arrived bleary-eyed in San Cristobal de las Casas after the overnight bus ride from Oaxaca. Gaby, our G Adventures CEO, recommended we book one of the half-day Mayan village tours. Specifically, the morning tour, which would free up our afternoon and the following day to do whatever we wanted. She warned us that our local guide could be a bit intense, but it was out of a sense of duty for him to protect the local culture. I'm sure that also implied keeping the villagers happy, because they could easily put an end to the tours if the problems they created outweighed the revenue being generated. The cost of the four-hour tour is 200 Mexican pesos ($15), with a portion going to each of the villages visited. 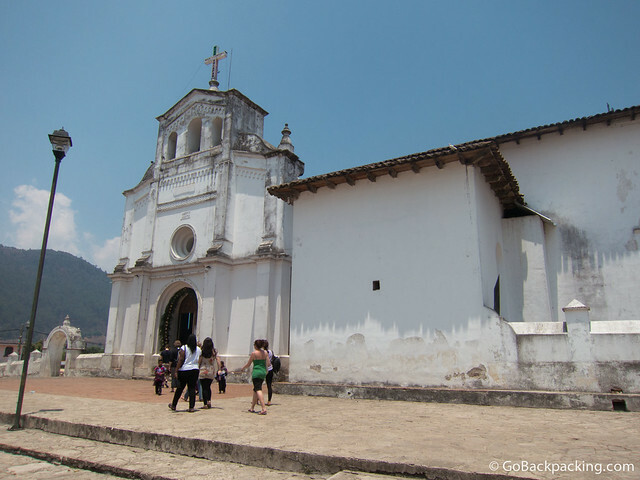 We all agreed, and after breakfast, met with other travelers near San Cristobal's cathedral. From there, we met our local guide, and boarded a minivan for the 10km drive to the first village, San Juan Chamula. We stopped short of the town center to visit a graveyard surrounding an abandoned church. Villagers were attending one of the graves, and our guide took the opportunity to talk to us about photography. He said it was OK to take photos of them from afar, but not up close. This first opportunity was an easy call for me. I prefer not to take photos of anyone visiting a gravesite, regardless of the country or culture. 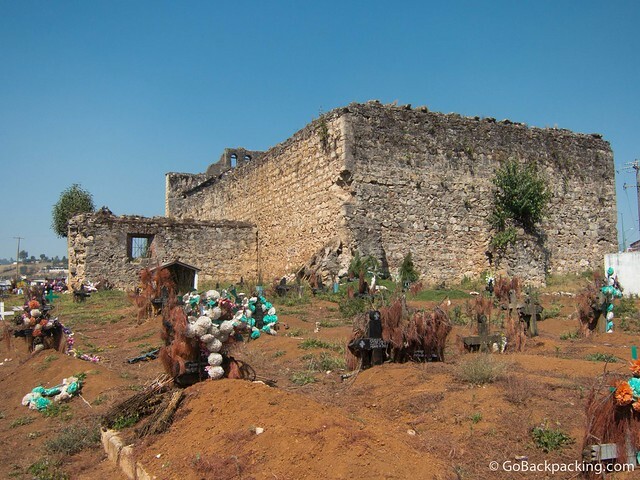 Instead, I focused on the graves themselves, decorated with flower-bearing wooden crosses. 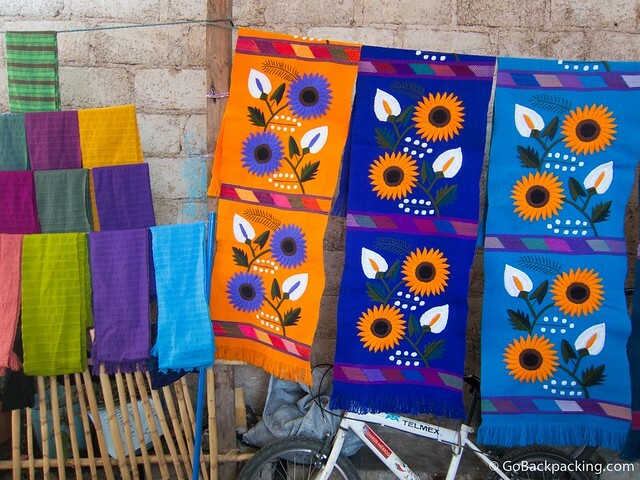 After a brief stop at a villager's souvenir shop, where we learned about various forms of local dress, we walked for about ten minutes to the main plaza. Located 2,200 meters (7,200 feet) above sea level in the Chiapas Highlands, Chamula boats a population of about 50,000 people. One of the most interesting things about the village is its autonomy from the rest of Mexico. For example, regular Mexican laws do not apply here, nor do Mexico's police or army patrol here. Chamula has its own police force, and some interesting forms of justice. Our guide made it a point to show us the jail, whose cell features a “window” out onto the street. He said prisoners are kept no more than one day in the jail. That might seem like a light sentence, but justice is also served in more Draconian fashion too. He explained that a few weeks earlier, three men attempted to steal a car. One of them was caught and burned alive on the spot, as a warning to others not to steal. That story caught all of our attention based on the speed and severity of punishment. Lesson: don't mess with Chamula. 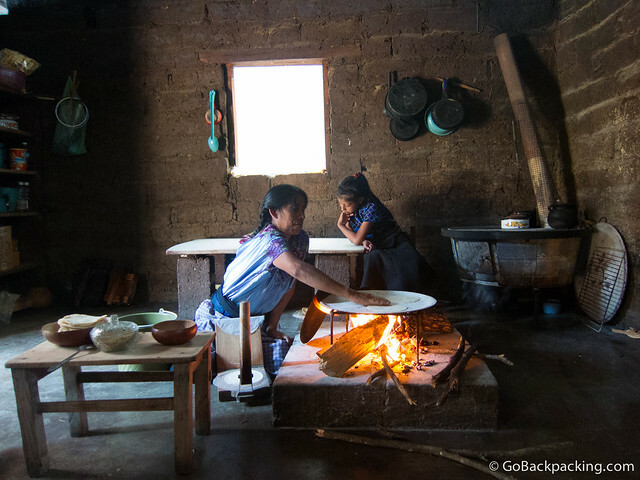 Another interesting facet of village life in Chamula is the mix of Catholic and ancient Mayan religious traditions. 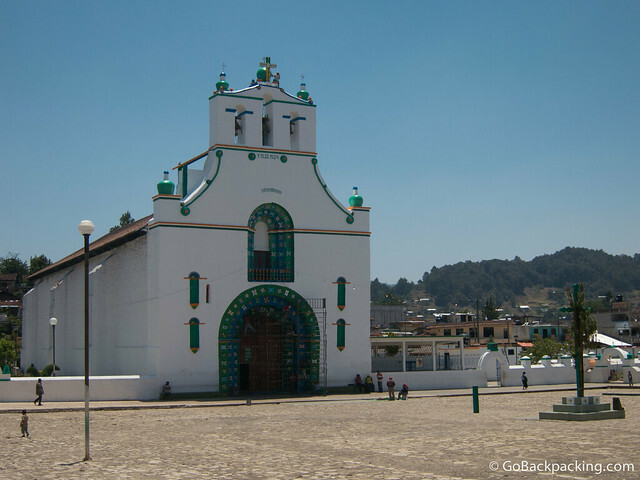 The church of San Juan Chamula looks normal from the outside, with its whitewashed walls, but the interior is unlike anything I'd ever seen. And I've walked through hundreds of churches and cathedrals in my travels. Before entering, our guide instructed us that absolutely no photographs were allowed because the indigenous Tzotzil Maya people believe cameras have the ability to steal their souls. Not on could we not take photos, we had to make sure our cameras were either in our pockets, or for those with DSLR's, that they were in a bag or otherwise covered. The church is incredibly dark inside, with lighting provided by hundreds of candles. The floor is covered in pine needles. There are no pews, which makes it one big open space. Both walls are lined with religious figures in wooden and glass cases. In front of the various figures are villagers of all ages lighting candles of various colors. Our guide informed us the colors of the candles coincide with the colors of corn: red, black, yellow, and white, plus green (which represents Earth). Some are there with shamans, or medicine men, who perform elaborate ceremonies to help them or their family members overcome problems, such as illness. The shaman also use sodas of various colors. While it seems odd for Coca Cola and Fanta to be used in a religious ceremony, our guide suggested it may be the color of the soda they're after, and that in the past, they may have used corn-based drinks instead. The shamans are also known to sacrifice chickens within the church, and one of the travelers in our group saw such a chicken awaiting its demise. Upon exiting the church, we were given 15 minutes to walk around the plaza on our own. Of course I took this time to buy an ice cream, and contribute to the local economy. The second Mayan village we visited was Zinacantán, 7km west of Chamula. Our first stop was a family home where souvenir textiles are produced. More interesting to me than the textiles was the invitation to sit in the kitchen while one of the ladies cooked up fresh tortillas for us. 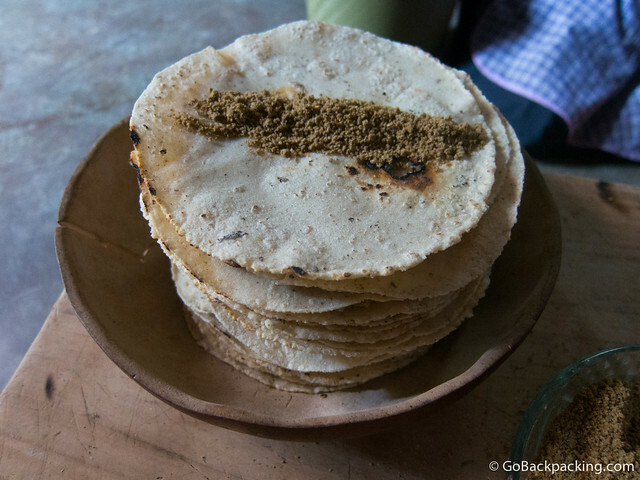 The tortillas would've been bland by themselves, but they also offered us a mixture of crushed pumpkin seed and salt to spread across them. Once you rolled up the tortilla, and bit into it, the pumpkin seed melted in your mouth, offering plenty of flavor to go along with the tortillas. It was incredibly simple, yet very tasty, and a combination I'd never been offered before. Once we'd had our fill of tortillas, we took a brief walk through the Church of Zinacantán, which looked similar on the inside to Western-style churches. The pews, sunlight, and lack of shamans and sacrificial chickens presented a stark contrast to the religious traditions in nearby Chamula. My Mexico Ancient Civilizations tour was in partnership with G Adventures. Any opinions expressed are entirely my own. No Mexican laws at The Mayan Village of San Juan Chamula!! amazing. I wonder what the interesting forms of justice are? I hope not too severe. Not sure if you missed it in the article, but I included an example of a thief being burned alive by villagers. That’s extreme justice. Those tortillas sound amazing! I’ve heard great stuff about this town. The inside of the Church of San Juan Chamula is one of the most incredible sights I’ve seen anywhere. Wish photos and video were allowed. Not being able to take photos made me want to take them even more than usual! But, at the end of the day, I respect their reasons for not allowing it.